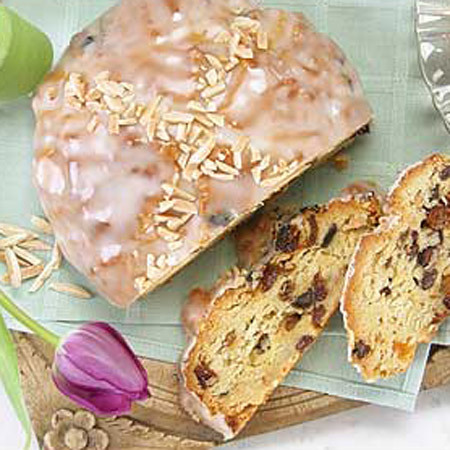 Each spring we make our "Jubilation Bread" to celebrate this glorious season and life's renewal. Similar to our award winning holiday Stollen, each 1 1/2 lb loaf is moist and bursting with apricots, rum soaked raisins and slivered almonds. Beautifully finished with an apricot/fondant glaze, each loaf is gift wrapped in cellophane and pastel ribbons. Our Panne Jubilare is perfect for giving or sharing and delicious with coffee or tea on a gentle spring morning.